The Book Thieves: The Nazi Looting of Europe’s Libraries and the Race to Return a Literary Inheritance by Anders Rydell (translated by Henning Koch) is a non-fiction book which tells of the efforts of the Nazis to ransack European libraries, bookshops and private collections. 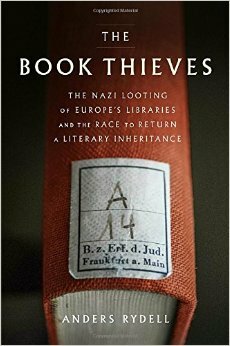 The Book Thieves: The Nazi Looting of Europe’s Libraries and the Race to Return a Literary Inheritance by Anders Rydell (translated by Henning Koch) is a fascinating look at another aspect of the Nazi killing machine, this time trying to murder culture and thought. Even more sinister, the Nazis used those stolen books to wage a war on history and even literature itself. The author did a great job investigating the stories of looting and, eventually, the impossible task of trying to find the original owners of the books. For at least one person, a worthless book (money wise) was the only thing left from the home he was forced to leave, after many years he was touched to receive some sort of childhood memory. This is a two part story, the first one, as the name of the book suggests, is the story of the Nazis trying to control people’s beliefs via literature, punishment and spectacles of burning books symbolizing “wrong” ideology. The second part is the painstaking cataloging of millions of books, returning what can be returned (through notes, plates and other identifying marks). The author also gives the history of some of Europe’s most famous libraries. This book is a fascinating and comprehensive account of the subject and an excellent addition to any World War II scholarship collection.